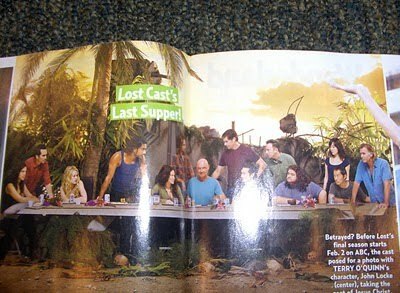 For all of my fellow Lost fans, we have less than a month until the season premiere of Season 6, the final season. One web site says it’s no coincidence the season premiere is airing on Feb. 2, Groundhog Day. Ugh. Does that mean we are going to relive the same day over and over for two hours? Or maybe 18 hours — the length of the entire season? I also found this promo photo that originally was published in USA Today. It’s “The Lost Supper”, an obvious reference to Da Vinci’s painting “The Last Supper”. Bartholomew, James, son of Alphaeus and Andrew form a group of three, all are surprised. Judas Iscariot, Peter and John form another group of three. Judas is wearing green and blue and is in shadow, looking rather withdrawn and taken aback by the sudden revelation of his plan. He is clutching a small bag, perhaps signifying the silver given to him as payment to betray Jesus, or perhaps a reference to his role within the 12 disciples as treasurer. He is the only person to have his elbow on the table. Peter looks angry and is holding a knife pointed away from Christ, perhaps foreshadowing his violent reaction in Gethsemane during Jesus’ arrest. The youngest apostle, John, appears to swoon. Apostle Thomas, James the Greater and Philip are the next group of three. Thomas is clearly upset; James the Greater looks stunned, with his arms in the air. Meanwhile, Philip appears to be requesting some explanation. Matthew, Jude Thaddeus and Simon the Zealot are the final group of three. Both Jude Thaddeus and Matthew are turned toward Simon, perhaps to find out if he has any answer to their initial questions. So, with that explanation, that would mean John Locke is taking the seat of Jesus. Jack would be doubting Thomas and Sayid as Judas. Hmm. Those all make sense with the storyline. I also found this creepy trailer on YouTube. Take a look. It gives another obvious religious comparison, with quite a fatalistic and distorted viewpoint. Let’s just hope the whole season DOESN’T turn out to be one big chess game played by the gods. That would be a very disturbing ending for me. So, what do you think? Have you heard any news about the upcoming season you can share?